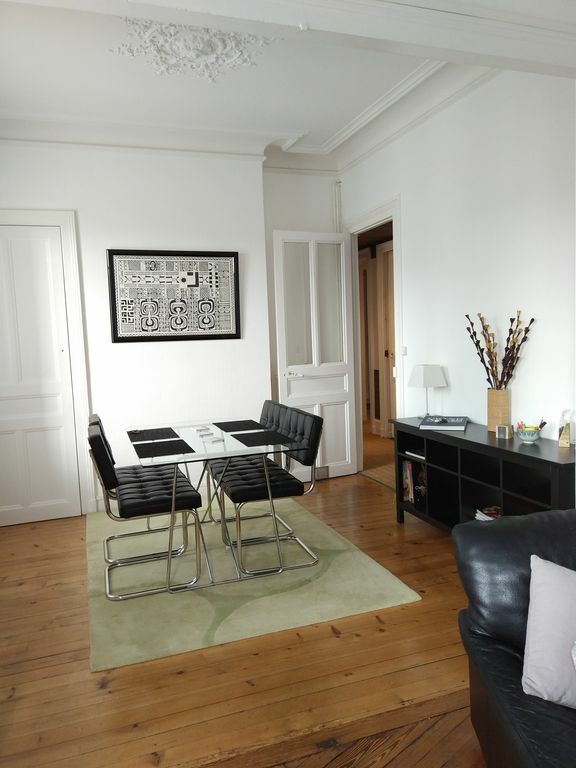 400 m from the station, 900 meters from the town hall and only 2 km from the beach accessible by tram, we offer an apartment while Haussmann-style comfort located on the 1st floor. With a capacity of 2 to 4 people it is ideally located to stay and discover Le Havre whose rebuilt center was inscribed by UNESCO on the list of World Heritage of Humanity in 2005. > Minimum stay: weekends: 2 nights and weekdays: 3 nights. The 177 Le Havre is an apartment labeled Clévacances category 3 key and classified 3 stars by the Ministry of Tourism. The 177 will also be necessary for stays and business professionals. Thanks you so much for your kindly comment. I was happy to welcome you in Le 177 Le Havre and it was a pleasure to speak with you. I would be delightfull to welcome you again. This practical, stylish and comfortable apartment is in the perfect location for the town and area! We have absolutely loved everything about our stay at the beautiful 177 Le Havre! From beginning to end, Patrice was the perfect host - with a huge amount of information about this great city upon arrival, being on hand when we needed him during our stay and an efficient and friendly check out. The apartment itself had everything we needed and we felt so at home. Our daughter loved the large and comfortable sofa bed in the office/library and we all found the kitchen to provide everything we needed. The design of 177 really means you're sure to enjoy staying in as much as going out exploring Le Havre and Normandy. About Le Have; wow! The city provided us with so much more than we expected so happy 500th indeed. If you're planning on coming make sure you don't miss Le Tetris and the incredible views (take a walk back down through the residential streets), the stunning Église Saint-Joseph, swimming at Les Bains des Docks (like no other pool we've ever seen! ), Les Jardins Suspendus with yet more amazing views and the library at Le Vulcan. Also, we found parking down at the beach for free a lot more convenient than we thought - plus you get to ride the superb tram! The apartment is in an amazing location for everything mentioned and incredibly, so very quiet at night (bearing in mind how central it is). In conclusion, if 177 Le Havre is on your shortlist of places to stay, book now! We certainly recommend it for any single, couple, small family or group. Thanks you so much for this warmfull comment. It was great to welcom perfect hosts like you. You are wonderful ambassador for Le Havre. We will be happy to welcome you again in Le 177 Le Havre for a next stay in Normandy. Best regards from LH (Le Havre). tv. Patrick welcomed us with a gift of fresh bread and cider of the terroir. Our location was convenient to the city and the region. Thank you for our nice stay. Thank you so much Sue for your nice comment. I keep a good memory of your stay in our flat Le 177. Hope to see you again for a future stay in France. Merci à Patrice pour l’excellent séjour que nous avons pu passer dans son bel appartement. Patrice, qui a une très grande connaissance de sa ville, sur le plan culturel, architectural et historique nous a donné de précieux conseil pour nos visites d’un WE, un peu court, au Havre. Merci aussi pour son accueil généreux ( Une belle brioche et une bonne bouteille attendait notre arrivée ) et son appartement très agréable pour la détente en soirée. Une adresse parfaite que je recommande pour un WE ou plus. Merci Madame pour ce très gentil commentaire. J'ai été ravi de vous accueillir et d'échanger avec vous. Au plaisir de vous accueillir à nouveau. Nous avons été accueilli par le propriétaire des lieux. Très important de le préciser. L'appartement est bien placé, lumineux, bien équipé, et décoré avec goût. C'est une adresse à retenir pour un séjour sur le Havre.